The NH Geneva Airport Hotel is situated next to the airport of its namesake, making the transition from plane to room easier than ever. 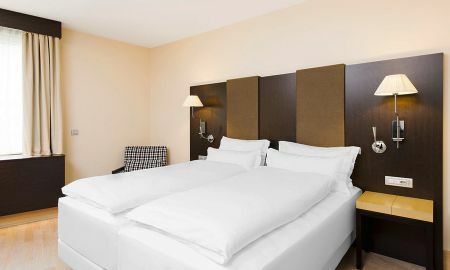 The hotel is just minutes from a tram stop for trips into the city centre, and to Lake Geneva. Even the ski slopes are less than an hour’s drive away. The hotel’s 190 rooms are smart and stylish, and feature dark hardwood floors. A variety of room options are available, and can also accommodate families. A balanced, healthy buffet breakfast is freshly prepared each morning, served under the glass roof of the hotel’s Le Pavillon restaurant. Light snacks and main meals are also available at Le Pavillon throughout the day. The ground-floor bar opens daily from mid-morning until late, serving delectable dishes- including a very popular club sandwich- as well as drinks. The hotel’s Open Bar venue is open around the clock to serve high-quality, tasty food and drink- whether it be for a grab-and-go on the way out, or for a midnight snack, there’s something delicious for every moment. The NH Geneva Airport also offers guests the use of its fitness area on the fourth floor, as well as a sauna for relaxing in afterwards. Less than 7 kilometres from Geneva’s historic city centre, the hotel lies in the heart of the new Geneva shopping district. Both Geneva Airport and the PALEXPO exhibition and conference centre are just 1.5 kilometres away from the property.